Organic Well Being: What’s the Best Probiotic Sources for Vegans? Your gut is home to good and bad bacteria, and maintaining that balance can be much more important than you think. Sure, maybe most of you already know taking probiotics (the "good" bacteria) can maintain healthy digestion, but did you know recent studies suggest even more positives, like an immune system boost and mental health support? If you're feeling a little rundown and you're not sure why, then maybe probiotics could help. But how can you get those probiotics from a vegan diet? Because veganism cuts out all animal products, proper nutrition—especially for the new vegan—can be tricky. If you're planning on getting your probiotics from food sources, there are some options out there that aren't exactly vegan-friendly. For example, dairy-based yogurt is no longer an option; however, you can always make or buy your own live-cultured non-dairy yogurt. Coconut milk yogurt is becoming more common in the grocery stores today, and are a much better option (health-wise) than soy-based yogurts. A well-known choice is certainly the traditional pickle, but any vegetable that's been pickled or fermented with bacterial cultures (in addition to salt and spices) can be a great probiotic source. Kimchi, for example, is an excellent probiotic choice for this reason. 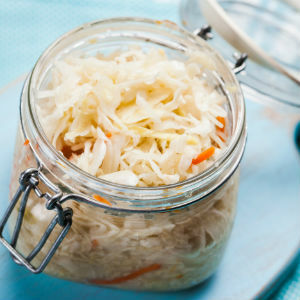 Always keep in mind, though, pickled and fermented vegetables can contain high levels of sodium. Fermented from black tea, kombucha also has sugar, yeast, and—you guessed it—probiotics. It's a popular item in stores right now, but always be sure you're looking for a product that's been tested; this helps rule out the presence of "bad" bacteria. As one of the healthiest diet options, veganism can be extremely rewarding for your health. A poorly planned vegan diet, however, can definitely be nutritionally deficient. Finding reliable probiotic sources—like the ones listed above—can help with that, as can a good vegan supplement. Have you considered taking probiotics or switching to a vegan diet for your health? Tell us about it in the comments. The post What’s the Best Probiotic Sources for Vegans? appeared first on Dr. Group's Natural Health & Organic Living Blog. Don't eat those nasty little suckers. PLEASE! How Does Meat Cause a Toxic Colon?